Thanks to CC Strummer, Young C. for this picture. Surprise! Surprise! That’s what happens last Thursday morning when a whole class of little ones from Farragut Elementary School in Culver City unexpectedly drop by my ukulele group, The CC Strummers, to sing a special song FOR US and leave a bundle of hand-made valentines on the table. It is Valentine’s Day after all! 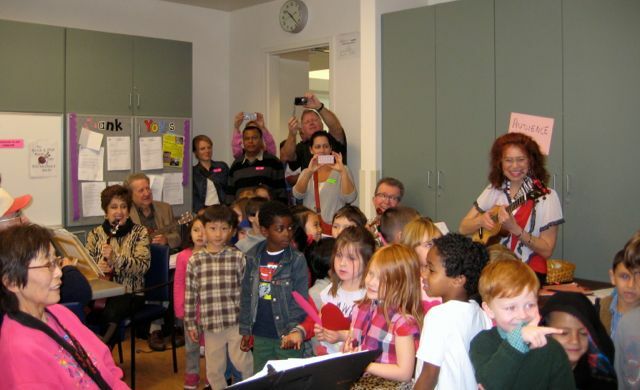 There are as many kids as ukulele players and they joyously squeeze into our already jam-packed room. With parents and teachers in tow. When the kids finish, we applaud them heartily and they start to leave. Ah… Not so fast little ones! We have ukulele players here! The CC Strummers launch into a group kanikapila, singing “This Old Man.” In the key of C. By ear! The kids are thrilled. Their little eyes are big as pancakes and after we end the song at “This old man, he played seven, he played knick-knack up in heaven,” all of us — grandmas, grandpas, parents, tiny music makers — are cheering and frankly, glowing… From the inside-out. In this life, you just don’t know what’s going to happen in the next five minutes! Giant meteors crashing from the sky… And unexpected visits from little valentines!